← “Check your Privilege!”: Bidding penguins to fly. Every great story has to have a source of tension. Without tension, a “story” is nothing more than the description of scenery. Recently I watched and thoroughly enjoyed Clout Atlas. The reason I fell in love with this movie is because the tension at the heart of the movie was the tension at the heart of humanity. In this post I want to take a minute to talk about this tension, why it is a perennial tension humanity faces and how this movie invites us to consider our place within that tension. For those of you who have not seen it, the actors in Cloud Atlas play various roles throughout the movie as small story lines unfold from the South Pacific in 1849 to a post-apocalyptic earth in 2349. These story lines are all connected together thematically and temporally in order to make up the larger story arch of the movie. Each of the small story lines in focused on a minority that was being exploited or oppressed. Racial minorities, sexual minorities, women, the poor, the elderly, hypothetical fabricants (clones designed to be slaves) and non-violent sheep herders were all faced with injustice and threats that power inequalities prevented them from responding to. The villains of each story line were the dominant majority (both individuals and the uncritical masses) that was using their place of power to exploit the minority. This exploitation was often done under the guise of “maintaining order” in the world or simply going along with the status quo. Slave traders, heterosexuals, men, the wealthy, retirement home workers, the police state of Neo-Soul, and the warlike cannibal tribe that preyed on the sheep herders all took advantage of those who could not defend themselves. The power differentials in the status quo protected them from facing any reprisals or resistance and they took advantage of this. The heroes of each story line were those that worked against this exploitation and “the order” it was allegedly protecting. Some of these heroes arose from within the ranks of the oppressed themselves and others were outsiders or those from the dominant group that resisted the temptation to profit themselves at great cost to others simply because they could with impunity. When finally in full focus by the end of the movie, the larger story arch was built around the tension of exploitation. What was at the heart of Cloud Atlas was “the way of the world,” the way of the strong preying on the weak, the ideology and systems that enable such exploitation, and the efforts of some to resist it. This tension, the temptation of the strong to exploit the weak, often for no better reason than they can with no real consequences, and the work of a few to resist this perpetual temptation, is perhaps the most fundamental tension in human existence. While the small stories in Cloud Atlas were fictional (if set in historical realities and believable hypothetical ones) human history is filled with small stories and larger arcs of history that revolve around this same tension. Thinking of Western history alone in the last several centuries we can see colonialism, slavery, imperialism, exploitation, sexism and a variety of other problems are all rooted in a dominant or majority group exploiting another with little consequence and the work of a few to turn the tide. 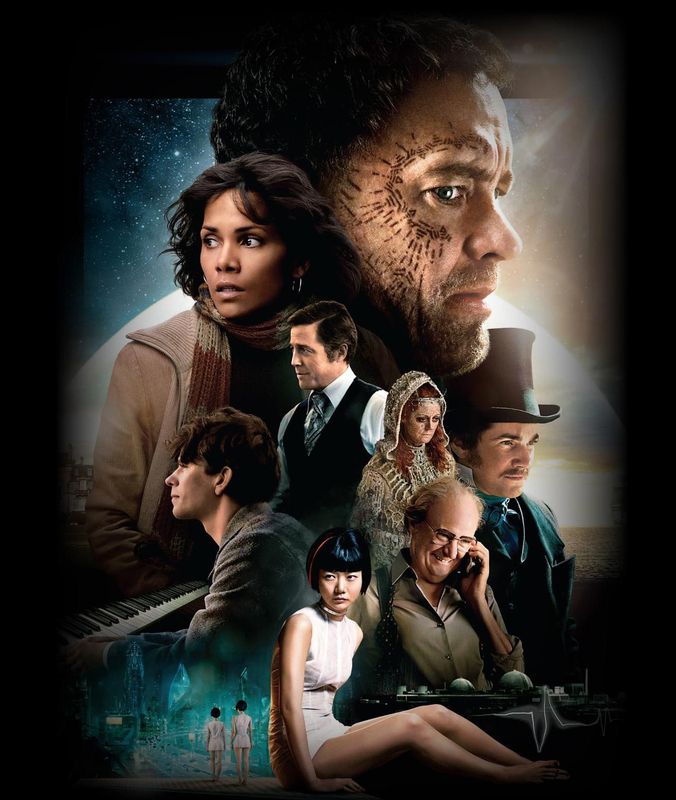 By showcasing this tension across various time periods and featuring different exploited and exploiting groups, Cloud Atlas underscored the perennial nature of this tension. While society might have addressed one form of injustice, there appears to always be inequalities of power that allow the dominant group to exploit the more marginalized in our societies. When those in the dominant group succumb to this temptation a new cycle of injustice starts again. As if to hammer this point home, the writers decided to have the most primitive human community featured in the film set in the farthest future. Contrary to the Modern idea of infinite progress towards a man-made Utopia, in the 2349 of Cloud Atlas we watch a story where humanity has experienced an unexplained apocalypse. What remains of humanity are tribal communities and the most pressing danger humans face in 2349 is not nuclear arms or environmental collapse, but cannibalism. The strong in this story line are quite literally eating the weak. This is perhaps the fundamental tension of humanity expressed in its most basic and symbolic form. Or as a quotation from the movie put it, “The weak are meat and the strong eat.” The point is clear, and I believe true. Humanity is not going to escape this tension anytime soon. By highlighting this tension, its historical reality, and its repetitious nature, Cloud Atlas invites us to introspection into our lives and the nature of our society. I believe this introspection is needed as we have fooled ourselves into think we are better people in a better society than we actually are. Do we want to live in a world where some minorities gain legal equality as other minorities lose them? Do we want our children to have to work towards resolving an inequality we ignored today? Do we want to live in a world where underpaying undocumented workers to harvest the food we eat is accepted as just the way of things? Do we want to live in a world where civilians in other countries who cannot truly defend themselves are killed to ensure our safety? Do we want to live in a world where workers are subject to dangerous working conditions and earn meager salaries so we can buy cheap clothing and corporations can maximize their profits? Are we part of the dominant majority succumbing to a passive or active exploitation of the minority, simply because we can? Do we want to live in a world where the strong exploiting the weak is accepted as the unchangeable if regrettable status quo? These are the types of questions we need to ask ourselves, and we must be brave enough to envision answers to them we can live out if we are to make this world a better place in any meaningful way. This entry was posted in Personal Commentary, Politics, Uncategorized and tagged Cloud Atlas, exploitation, politics, tension. Bookmark the permalink. I pray that Modesto is still in God’s plans for you!…. His Presence is very strong at Soul Harvest Worship Center and MORE, MORE, MORE is needed to wake up ALL of HIS people in Modesto to the Living, ABIDING PRESENCE that casts out all fear and works of the devil! Blessings!